Welcome To The First Hole at Osprey Links, an extreme dog leg right. This hole is a wonderful start to your day on the Links. 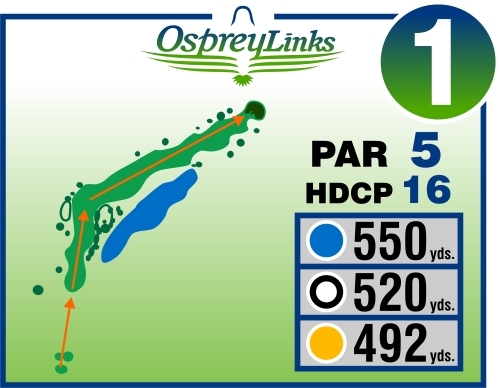 Depending on the tee of choice, a large pond borders the right side of the fairway approximately 200 yards off the tee, and just beyond the pond sharing the same side of the fairway are two strategically placed bunkers. Don’t be errant right on the second shot or water surely awaits you, but lots of room to the left from the dog leg to the green. For the real big hitters, the green can be made it two, but for most, a short wedge will be required to hit onto one of the smallest greens on the course.